Bottega Veneta Knot has changed my view of orange blossom fragrances. For me, orange blossom often takes one of two directions: it’s either a sweet bridal concoction or a laundry-fresh soap monster.1 Knot is something else. Although it definitely focuses on orange blossom, it’s dry and herbal, yet holds a sweet, musky core deep in its dry down that gently harkens back to the original Bottega Veneta. If you ask me, Knot is one of the few rewards of department store perfumes. Perfumer Daniela Andrier (Prada Infusion d’Iris, Prada Candy, Marni Marni) developed Knot. Its notes include clementine accord (mandarin, limette, neroli, and orange blossom), lavender, rose, peony, musk and tonka bean. Of all these notes, orange blossom rises to the top with its soapy-musky feel. But instead of coming off as a guest bathroom soap extravaganza, Knot feels classic in its subtle, clean-woody presence. As Knot wears, and as you’re sure you’ve explored all this crisp, dry orange blossom has to offer, it reveals another, richer dimension with a sweet wood and musk that casts a quick glance back to the original Bottega Veneta Eau de Parfum’s lush suede-amber-patchouli. It’s subtle, but it adds a bonus fondant to what’s already a wonderfully blended meditation on orange flower. I plan on recommending Knot to both men and women who are just wading into perfume and who tell me they want to smell clean and subtle. The beauty of Knot is that once these scent newcomers have built up a tolerance for more assertive fragrances, they’ll still find something to appreciate in Knot’s sensitive treatment of “fresh.” I wouldn’t be surprised if they return to it for years to come. As for me, Knot is one of the few department store perfumes I’d spring for in a minute if it weren’t so danged expensive. (Since when has $160 been standard for 75 ml of Eau de Parfum?) I’ll grumble here on the sidelines and enjoy the last few spritzes of my sample. 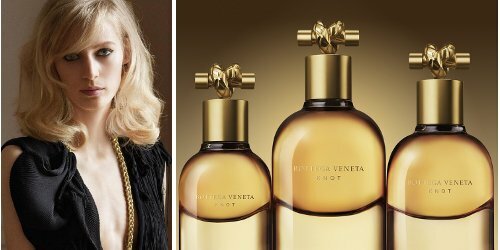 Bottega Veneta Knot Eau de Parfum comes in 30 ml ($90), 50 ml ($125) and 75 ml ($160) and has matching body products. Knot is available in high-end department stores. 1. Vero Profumo Rubj and L'Artisan Parfumeur Séville à l'Aube are two exceptions that come to mind right away. My seasonal-Nordstrom-employee-for-one-week insight: I’ve seen a LOT of people try this one, but no one has actually bought it yet. I wonder if it’s a little too different for mainstream tastes. I still prefer the first Bottega Veneta- no matter how herbal, orange blossom is not for me. How interesting! Man, you are going to have a lot of stories about your Nordstrom stint. It’s also interesting about Knot. It’s not a flashy fragrance, and I can see why that might work against it (even if it earns points in my book). I hope they are nice to you! You are a Gem!!! I haven’t tried this yet. My Nordstrom is super pushy in the fragrance department. Sometimes I think the commission bit gets in the way of a great sales experience at Nordstrom, although I do really appreciate most of the fragrance SAs at my local store. But I’ve started buying most of my cosmetics at Sephora to avoid the buy-buy-buy pressure I feel at Nordstrom sometimes. I loved this one, too. Handily wins “Best of Department Store 2014” award. Oh, except maybe tied with the new Narciso. It’s been a good department store year for me, even just with those two. I still haven’t tried that one. I can’t believe I’ve forgotten about it. Must remedy. Don’t be shy about asserting your taste, whatever it is! Mine is changing all the time. I’m with you on that–this one and Jour Absolue. I’m yet to give Knot a proper wearing, but I’ve found Narciso to be more immediately likeable so – for the time being – it would be my pick for best mainstream this year. And now I truly will try it the very next time I pass a department store! This is funny……I was just talking about this with Sun Mi in the SOTD comments today. When I saw that Robin was reviewing it, I got out my sample that I received on Saturday and gave it a whiff. OMG! I was just thinking that I haven’t smelled anything lately that took me aback. Finally, something that smells different and is “clean” smelling. I see a FB purchase of this in the near future. I agree with Erin. This probably deserves the “Best of the Department Store 2014” award. This is a well done fragrance! And the bottle is exquisite! “Classy” paired with “dame” is especially un-classy. A friend was dumped by an internet-met fellow who believed he was letting her down gently by calling her a “classy lady”. I bet he was a real “foxy gent,” too. Edit: Sorry. Angela reviewed this, not Robin. Forgive me! Oh my goodness – how exciting to see my name pop up in the comments! I hadn’t actually tried it but since its now 3 and the baby is napping, my mall trip is delayed until tomorrow (but I must go before this impending Wed snow?). I just spritzed Knot on my wrist now! Also – Nordstrom has the gift sets that have the large bottle, lotion and ridic cute mini bottles for 165 (if I remember correctly). Oh, that’s a bargain, then, compared to the price of the 100 ml bottle alone–that is, if anything in perfume can be called a bargain these days. Thanks! Maybe Santa is listening or looking. That sure would look great under my tree. …And the bottle would look terrific on your dresser. I wouldn’t be surprised to see it on a few “best of” lists this December! Great review, Angela. Always enjoy your sense of humor and the images you give us.. bathroom in a sailboat – yes! I can see that with this scent. BV NYC store was quite generous when I popped in after this first came out. When asking for a sample she gave me a mini 7.5ml bottle. Don’t see those given away much these days! Can’t figure it out, but the dry down is a bit off for me – as in, makes me queasy. Not sure if it’s the lavender with this combo of notes, or musk, but there’s something there. I’ve worn it a number of times and I start off really liking it, and then I don’t. How spectacular to get such a generous sample! As for it not drying down well on you, I know I’m always secretly a little happy when something isn’t marvelous on my skin. My wallet can’t bear the pain. Floragal – I am glad I am not the only one that didn’t care for it. I made the mistake of buying it unsniffed. I should learn my lesson. Did not like it at all, but I am pretty new to the perfume world so it is probably just me. I’m pretty new to the perfume world too, and so far I don’t love it on skin. On me it does end up a bit too soapy and laundry-esque – not unlike a bounce dryer sheet mingled in the load of dry clothes. Not necessarily unpleasant, but not necessarily how I want my perfume to smell. You may not be a big fan of orange blossom–which is a good thing to know! That may be true – though I do really like Seville a L’Aube – which you mentioned as well. I’ll have to go through my spreadsheet to see if I’ve tried others with orange blossom (yes, i’m pathetically keeping a spreadsheet with notes/perfumeurs and then keeping a blog with more detailed thoughts, haha). So far I only really know that I do NOT like patchouli, and actually aren’t that fond of amber either. You are so good to keep a spreadsheet. I think somewhere I have an excel sheet I started at some point, then pooped out on. It would be great to have as a reference. Buying unsniffed is so dangerous! (I’ve done it plenty, and have the battle wounds to attest to it.) I hope you can return or swap the bottle for something you truly love. With all its simplicity, this one keeps me somehow more interested than the rest that I’ve tried from Daniela Andrier. She’s such a talented perfumer, but I admit that I only know her greatest hits, like Infusion d’Iris. A 100% Daniela Andrier style. If I didn’t know this is Bottega Veneta I would think that’s another one Prada (Infusion d’Iris) flanker. Daniela Andrier combined neroli & orange blossom layering with her signature soapy musky lavender base. The result smells as a mix of Elie Saab (orange blossom and white flowers) and Prada Infusion d’Iris/d’Homme with addition of green neroli from Martin Margiela Untitled. Very soapy with a neroli cologne twist. The fragrance is an essence of Daniela Andrier style. Well crafted and beautiful, though too soapy and cologne-ish to my taste. The heavy bottle is a masterpiece! Well, it sounds like people with bottles of other Andrier fragrances just might be able to mix their own Knot by following your instructions! I agree on the bottle: it’s gorgeous. Anybody else think this starts sounding like a bar keepers recipe? Reminds me of the Nutty Professor with Jerry Lewis the nightclub scene at the bar. I haven’t seen that movie in ages! I have this week off work, and that would be a perfect one to play while I knock off a pile of mending. Now I feel like I got two great reviews by reading this page! Me too! I can’t tell you how many times I’ve come away from comments, though, with the name of a new movie to see, book to read, or some fascinating and arcane fact. Oh, Angela…. you definitely had better luck, than I did. All I got BV Knot, was “expensive” Pine-Sol. While. a well-made fragrance…. who would want to smell, like the stuff used to clear a bathroom floor? Such a shame, as the bottle is gorgeous. Considering how much I still wear the original BV, I was thrilled to hear about Knot, especially since it features one of my favorite notes. While the reviews seem to be mixed, yours is encouraging, Angela, and I will still happily sample it if/when I can track some down. I have to agree there have been some great department store perfumes this year. The new Narciso is also on my must sample list since I’ve liked many of NR’s frags. Jour de Hermes Absolue also made it on my buy list. So nice to find great perfumes that don’t necessarily have to break the bank and are relatively easy to find. Knot is definitely not like the original BV, but it’s worth sniffing, I think, if you want something crisp, subtle, and clean–and you like orange blossom. Everyone is talking about the new Narciso. I MUST smell it. Angela, you must try Narciso!!!! It was my favorite new release of 2014, and I actually bought the gift set for myself. You’ve convinced me! This will be my outing at lunch tomorrow. I’m looking forward to it! Oh dear me no. I can’t handle Knot. To me, your bathroom on a luxury yacht, redolent of the clean tang of sea air, smells very distinctly of calone. I’ve tried Knot a few times and will try it again, but I cannot get around the calone accord. It takes me back to places I never want to visit again! I agree that the orange blossom in Knot is gorgeous, and it is wonderful to find a great mainstream fragrance. Restores some faith. I do like the original Bottega Veneta very much, so I’m not complaining. I get where you’re coming from, I do. The “sea air” is definitely there, but thankfully the fragrance is dry enough to balance it. In some ways, cleaning products have ruined orange blossom for perfume. I must have missed out on orange blossom-scented personal and household products when I was growing up because I don’t have the strong association that you do. It was all pine and lemon for me, or mint. But give me all of that stuff and then some, just not calone! Maybe the orange blossom bit is an American thing. But calone loathing seems to be universal. I think Eau d’Issey ruined it for everyone. Great review! A new fragrance from Andrier is always good news. I smelled it briefly (on a strip) when I was in San Fran @ Neimans and by then I was already coated in so many other fragrances so I didn’t have the ability to give it my full attention. I will need to try it again. Question Angela: Have you smelled Infusion d’Homme by Prada (also by Andrier) and if so how would you compare the orange blossom in Knot to it? I adore IdH! It’s been so long since I’ve smelled Infusion d’Homme that I couldn’t make a fair comparison. But if you love Andrier’s work in general, you certainly should get your hands on a sample of this–for completeness’s sake if nothing else. If you like IDH the new Knot is for you. It smells as 70% clone of men’s Infusion. Non-detergent is very appealing to me, not sure what to think of bathroom on a sailboat but I’d still like to try this one. Very expensive though, probably wouldn’t get a bottle. It sure is expensive! I feel like it’s $50 more than it needs to be for the 100 ml. Perhaps there’s a good reason for that other than marketing, but if so I’m not sure what it is. A sample of Knot landed in my mailbox this afternoon. Thank you for the review. You made my sample sniffing more fun. For someone who loves orange blossom I would say that Knot is a wonderful fragrance. I don’t quite love it, but I can’t stop sniffing my arm. Very interesting! Knot feels fresh and clean and seamless as it develops. For me, it doesn’t have any jarring or edgy moments, despite the loads of citrus and orange blossom I got at the start, and am still getting several hours on. Thanks for your mini-review! I think it’s interesting–and I completely identify–when you say that Knot is wonderful, but that you don’t quite love it. That sucker-punch of perfume love is rare but fabulous and should always lead to at least a decant (I think so, anyway). I got it into my head to try Knot, Infusion d’Iris, and Hiris in succession. So far Knot is #3 while the other two are battling it out. It looks like Hiris might take the lead. Did you try the Infusion d’Iris Absolue? That would be my pick of the bunch. Super idea. Thank you! I will give it a try. I really enjoyed know too! The gorgeous and generous, hefty thick glass bottle is also a visual and “tactile” treat. I would be lying if I say that it is not on my “need to get” list. What should a greedy heart do? Well…perhaps a 30ml will look like a steal after I pay for the parfum and one thing leads to another…. The BV original has a satisfyingly hefty bottle to hold, too! It’s such a big, thick, warm fragrance–I can’t even imagine how lush it would be in parfum. Enjoy it! I’m with Tiffanie… I keep sniffing my arm, and I like what I smell… and I betcha if someone walked by and I got a whiff of Knot I’d think they had good taste… but no need to tie me to the banister to keep me from a rush purchase. I think in the end it is just too darn clean, despite its complexity, to hook me. I love that “no need to tie me to the banister” bit. (Note self: install a banister to help prevent future perfume purchases.) And I know what you mean about how nice it is, yet so clean that it’s not compelling–at that price, at least. Too clean is a good description for my nose. I finally understand “soapy” as it applies to orange blossom. Orange blossom and clean musk can both telegraph “soapy” in a major way. Sometimes I fear cleaning products have ruined a bunch of great smells: orange blossom and lilac are at the top of the list. I really would love a BV bag (could make it, if I did not buy all these expensive perfumes I guess!) and I liked the first BV scent, too. I sampled this and I liked it. It’s easy, but not bland, it’s elegant but not overdone, and it fits perfectly to the fashion BV is bringing out. That’s sort of where I came down on it, too: if I had a bottle, I’d wear it, but I didn’t feel compelled to buy one. I agree, too, I’d love to smell more of it on people around me! Earlier this month I discovered something useful: the perfume counters are filled with gift sets not only before Christmas, but before Mothers’ Day, too. So instead of paying $160 for 75ml of Knot, I paid $165 for a box containing 75ml of edp, a 7.5ml mini of edp, and 100ml of body lotion. Score! The lotion will be great for summer!